Looking to monetize your own video content to start generating additional revenue? Or are you seeking solutions to run sponsor and product placement ads on during your streams? 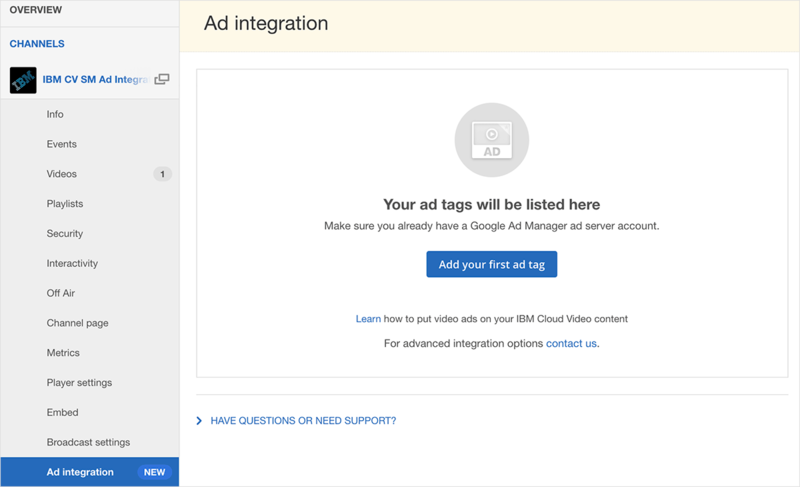 IBM’s video streaming solutions now offer a Google Ad Manager integration. This allows content owners to monetize their live and on-demand video assets through using virtually any 3rd party ad server that can run inside of Google Ad Manager. IBM’s video streaming player comes integrated with Google IMA (Interactive Media Ads). This allows content owners to use Google Ad Manager, formerly known as Google DFP (DoubleClick for Publishers), to begin serving ads with their video content. The IBM Watson Media player itself is VAST (Video Ad Serving Template) and VAPID (Video Player Ad-Serving Interface Definition) compliant. As a result, virtually any 3rd party ad server can be used to run ads through Google Ad Manager and IBM’s video streaming services. Once you have contacted the team at IBM Watson Media to have the ad integration feature enabled for your account, users can manage ad space from inside the dashboard of their IBM video streaming account. This is done by copying and pasting a Publisher Tag (Ad Tag) from Google Ad Manager and adding it to the Ad Integration part of a channel. Things like position, is it a pre-roll (before the content starts) or mid-roll (interrupts the content to play), can be determined along with the interval for mid-roll based advertising. In addition, once enabled for an account, this is all managed directly by the user. Note: you must contact us first before an ad integration can be enabled for your account. IBM video streaming accounts can also be collaborative, with multiple logins and users to manage assets. Consequently, multiple individuals, if given the right access levels, can setup new ads or even create manual commercial breaks. Meanwhile, Google Ad Manager itself will handle targeting, timing and also reporting analytics related to advertising. As for setting up ads, this can be done for each channel individually, with separate options also available for live versus on-demand content. Besides different ad formats, like pre-roll or mid-roll, ads can also be launched manually during content, giving an opportunity for someone to monitor a live stream and push commercial breaks during opportune moments. In addition, for mid-rolls, intervals can be edited as well after creation. When implemented, IBM Watson Media channels will send Google Ad Manager their content IDs. This allows users to target specific campaigns, even without using multiple tags. This is important as content types and ad placements have options to either use different tags or to utilize the same Publisher Tag. For channels that already have ads on them, the system will list every placement separately to allow insight on the user experience. Furthermore, to work within the collaborative experience with a focus on ease of use, the system will correct mistakes in the Publisher Tag and warn the user if there are choices to be made as well. This includes choices such as allowing or disabling personally targeted ads, a setting that can help with GDPR compliance. If new tags are being added, the system will also detect any overlap and work to resolve them: asking which ads to keep or to overwrite. A perk to using Google Ad Manager is access to Ad Exchange. This optional integration allows access to a virtually real-time marketplace that is built on buying and selling of advertising space. As a result, it provides the chance to utilize a giant inventory of targeted ads that can be used to backfill unsold inventory as needed. This gives access to a vast array of different advertisers and their content, while still letting content owners control what types of advertisements are run with their video assets. There are many use cases for video that are right at home with advertising as a monetization model, from sports to music based content. IBM Watson Media is simplifying ways to utilize video advertisements with video content through this Google Ad Manager integration, offering key opportunities to monetize both live and on-demand video content. For more details on using this ad integration, visit this Complete Guide to Setting Up Ads in Google Ad Manager.